Suddenly one day you are a parent. And it can be really hard to know what to do. When parents trade spiritual convictions for those of secular culture -- with its misguided principles and mistaken priorities -- our families, faith, and foundations are in trouble. Happiness has become the hallmark of successful parenthood in today's high-tech, low-touch world where faithfulness is for the foolish and parenthood is provisional. 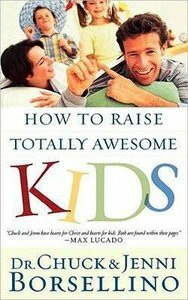 But now, Chuck and Jenni Borsellino offer a biblical, up-to-date, realistic guide for raising today's children, written in an entertainingly conversational style and not a cookie-cutter, warmed-over advice format. Learn how to make the child-rearing years rewarding for both parents and children! About "How to Raise Totally Awesome Kids"
Suddenly one day you are a parent. And if your parents weren't a good example, it's hard to know what to do. When parents trade spiritual convictions for those of secular culture -- with its misguided principles and mistaken priorities -- our families, faith, and foundations are in trouble. Happiness has become the hallmark of successful parenthood in today's high-tech, low-touch world where faithfulness is for the foolish and parenthood is provisional. But now, Chuck and Jenni Borsellino offer a biblical, up-to-date, realistic guide for raising today's children, written in an entertainingly conversational style and not a cookie-cutter, warmed-over advice format. Learn how to make the child-rearing years rewarding for both parents and children! Parenting is both exhilarating and exhausting…offering no reprieve and no recess! Moms are so emotionally drained they’re giving themselves a timeout! Dads are so frustrated even golf seems like fun! But don’t panic—there is hope! that will help you when your patience is failing and your blood pressure is rising! Whether you're a mom or dad in a traditional family, a stepfamily, or a single-parent family…you're just 10 steps away from discovering how good parents become great parents, average kids become awesome kids, and kids of comfort become kids of character.